4 hrs 15 mins. to 17 hrs 30 mins. 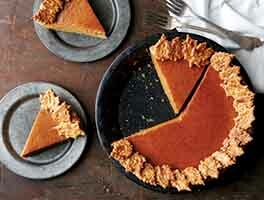 To make the crust: Blend the crust ingredients, and press into the bottom and up the sides of a 9" tart pan. Freeze for 15 minutes, then bake for 8 to 10 minutes. The crust won?t look much different; it'll just get slightly brown around the edges. Set aside to cool. To make the filling: Place the chocolate in a bowl. In the microwave or a saucepan, heat the cream until steaming. Add 1 cup cream to the chocolate; stir until smooth. If all the chocolate doesn't melt, heat mixture very briefly until all the chocolate is melted. 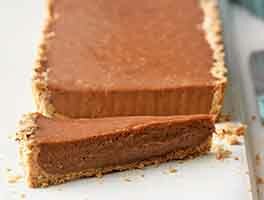 Brush 1/2 cup chocolate/cream onto the inside of the completely cooled graham cracker crust. Refrigerate the crust. Gradually stir the rest of the heated cream into the remaining chocolate/cream. Stir until completely smooth, then cover and chill 8 hours, or overnight. 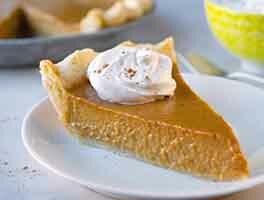 When you're ready to fill the tart, whip the chilled filling until stiff peaks form. Spoon into the crust, and smooth the surface. Freeze, covered, until ready to serve. To make the sauce: Heat the caramel and cream over low heat, whisking until smooth. Cool to room temperature. To make the garnish: Smear the butter into a 12" square on a cookie sheet. Spread nuts atop the butter, then sprinkle with a pinch of salt. Bake in a preheated 300°F oven for 8 to 10 minutes, stirring every couple of minutes. Remove the nuts from the pan and cool to room temperature. Sprinkle with additional salt, if desired. 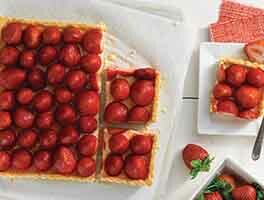 To serve: Transfer the tart from the freezer to the refrigerator 30 minutes before you want to serve it, to soften. 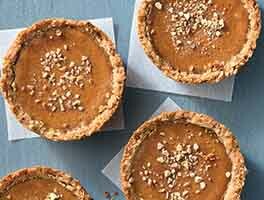 Drizzle with caramel sauce, sprinkle with nuts, cut, and serve. Yield: one 9" tart, about 16 servings. I made this dessert to take to Christmas Eve dinner, and it was a big hit. A few notes: 1) If you include crushing graham cracker crumbs, chopping chocolate, chopping nuts, making the crust, filling, topping & garnish, the prep time will be more than 15 - 25 minutes. Likewise, the total time is listed as 4:15 to 17:30. Since Step 7 calls for chilling 8 hours or overnight, there's no way the first time holds. Definitely plan to start this the day before. 2) I have a 10" tart pan. I multiplied all of the ingredients by 1.5 and it worked perfectly. About 20 servings in the larger pan. 3) In step 4, I put the chopped chocolate in the bowl of my stand mixer, poured the hot cream into the bowl and mixed it slowly with the whisk attachment. Covered the bowl, whisk and all, and chilled it. Ready to go to whip it later in the same bowl. Elna Rothenberger from Reading, Pa. I have made this twice and plan on making it several more times in the future! Both times, there were no leftovers. Fairly easy to make, and can be made well in advance which takes pressure off when you are having a crowd over. So far my favorite King Arthur recipe! I made this for my Mom's birthday. It was a big hit with everyone. I used mini tart pans and the hamburger bun pan that King Arthur sells. I doubled the recipe and made 12 using the pans I mentioned. This is a great dessert to make ahead. I use my birthday as an excuse to make a "birthday cake" that I can share with my coworkers. The only thing wrong with this recipe is that it didn't make enough! I might have to get another tart pan and make two next time, or maybe increase the recipe and put it in a regular pie pan and make it a bit deeper (or something). The unwhipped layer of chocolate on top of the crust was fantastic, and the mousse itself, consisting only of bittersweet chocolate and cream and then whipped, was easy and delicious. I think it would be great just refrigerated and eaten like pudding. The only changes I made were: I realized after I made the caramel sauce that the recipe doesn't actually say what to do with it. I tried spreading it on the frozen mousse when it had cooled but it was too sticky. I heated it back up a bit and drizzled it and spread it around, then just sprinkled on chopped pecans (didn't bother with the "garnish" prep) and put it back in the freezer. After it was frozen again, I sprinkled on a bit of fleur de sel. YUM! I've made this several times after seeing it in the mailer. The Merckens chocolate is absolutely divine! It is a crowd pleaser and so easy to make. We didn't wait overnight for the filling. We chilled it for about three hours... Who could wait! Nice presentation. 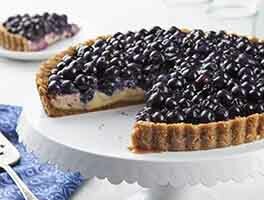 This tart was not only easy to make but incredibly delicious. I made a few changes which I think put it over the top. Since I didn't have Mercken's, I used Valrhona 70% bittersweet feves for the chocolate. When it came time to whip the chocolate and cream together, I added 1 tsp. espresso powder and 2 teaspoons kahlua. Those flavors just totally enhanced and deepened the chocolate flavor. Actually with those additions the topping was almost unnecessary but what the heck? It looked like hazelnuts were used in the picture. I used toasted peanuts and pecans with equal success. Just awesome!!! My 16 year old daughter and I were having a girls night and needed a treat. We thought this looked wonderful and decided to try. We couldn't wait overnight so we had to expedite. This dessert was fabulous! Once the chocolate was in the crust, we put that in the freezer and put the filling in the fridge as directed. But we left it there just under two hours and then whipped it. Phenomenal!! So rich and smooth! We also abandoned the nuts and after drizzling with the caramel, we sprinkled each piece with kosher salt for that salted Caramel flair. Yum! We can't wait to make it for a party! Note: I used a digital scale to weigh all ingredients and followed the directions exactly. I had quite a problem with the crust which is why I only gave three stars. Otherwise, this would have been a five. I found the crust to be way too crumbly to a) adhere to the top of the fluted edge of the tart pan and b) adhere to the bottom of the baked crust when brushing with the chocolate. I pulled up large chunks of the bottom crust.. Boo hoo! I definitely intend to make this again but will either use a pastry crust or will add more butter to make a less crumbly crust. The flavor was awesome and I will just have to keep making this til it comes out perfectly, right? I did just use the graham cracker crumbs right out of the box and the recipe does say to use finely crushed crackers. Maybe those elves should have crushed them more finely before selling them to me? Another killer KAF recipe! I got raves when I brought these to a recent party. Because it was a party, I wanted a much smaller version of the tart so instead of making up one, I parsed out the recipe into 2 muffin pans. Other than the pan change and dropping the baking time for the crust to about 6 minutes, I followed the recipe (though I decided to forgo the topping for ease of transport). However, if you do make up mini versions, I would recommend making up twice the amount of filling called for in the recipe as I ended up having to make up more the next day when I realized I wouldn't have quite enough. And besides, there's nothing wrong with having a little extra ganache around... After the tarts are frozen, let them set out about a minute and lever them out with a fork. Then pop them back in the freezer until they're ready to be served.